In a bowl, beat the eggs for the pancake batter. Add milk and combine. Add flour, garlic and salt and mix. In a pre-heated fry-pan, spoon in a ½ cup of batter at a time. Cook pancakes until bubbles appear then flip and cook the other side for 2-3 mins, repeat with remaining batter. Set aside or keep warm in oven on low heat. In a bowl, combine lightly beaten eggs, milk and cracked pepper and whisk. In a pre-heated fry-pan, pour egg mixture into pan. Cook the eggs gently, folding them rather than stirring them. Cook for 1-2 mins. 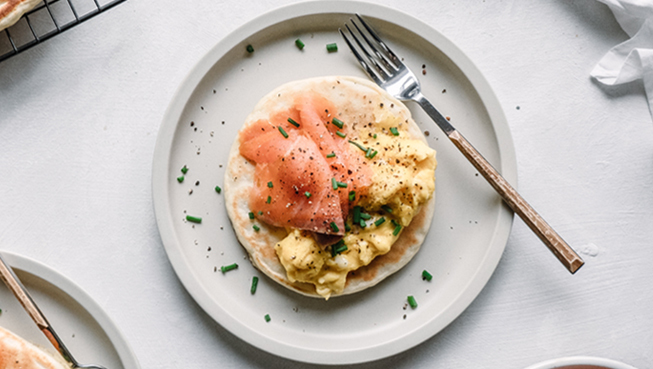 Serve pancakes with scrambled eggs and top with smoked salmon. Sprinkle chives over the top and enjoy!